A majority of older Americans say Medicare is working well. Nonetheless, they report more problems paying for health care and getting primary care than seniors in 10 other major advanced economies, according to a new Commonwealth Fund survey published in the journal Health Affairs. Medicare, the U.S. government health insurance for the elderly, has clearly eased the cost of aging and lowered the poverty rate among elderly Americans. 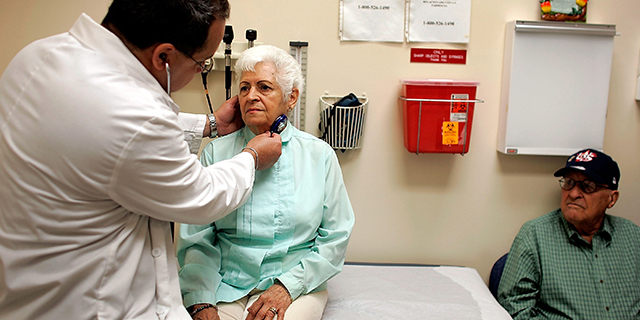 Yet, nearly one-in-five (19%) Americans ages 65 and older say they had a medical problem but did not visit a doctor, skipped a medical test or a treatment recommended by a doctor, did not fill a prescription or skipped doses of their medicine because of cost constraints. By comparison, a far smaller share of elderly Canadians (9%), British (5%) and French (3%) — all of whom have government-funded health insurance programs — reported cost-related constraints on access to health care. The survey, which focused on older adults (those 65 and over) in 11 countries, was conducted by telephone by the firm SSRS for The Commonwealth Fund, a research foundation that advocates for better health systems in the U.S., from March to May 2014. Advanced economies’ spending on health care varies widely and there are different levels of concern about the world’s graying population. The average spending, including investment in health, among these nations in 2011, the last year for which there is comparable data, was 11% of GDP, according to the Organization for Economic Cooperation and Development, the multilateral economics think tank in Paris. But the United States spent more (17%) than many of its peers, including France (11.5%), Germany (11.2%) and the United Kingdom (9.2%). This translated into great disparities in per capita health care outlays. Americans spent $8,483 per person on health care in 2011, compared with $3,212 per person spent by the British. In the survey, Americans seemed to realize this disparity in health expenditures. They were more likely to say they themselves are spending more on health care compared with seniors in other countries. About one-in-five Americans (21%) said they had out-of-pocket medical expenses of $2,000 or more in the past year. This is more than three times the median of 6% in the other 10 nations surveyed. And 11% of Americans claimed they had problems paying their medical bills. By comparison, the problem of affording health care was cited by only 5% of elderly British, 4% of Canadians and 3% of Germans. Defenders of the U.S. health care system have long claimed that the American approach delivers greater access to care when a person is sick. However, the survey suggests access is a relative concept. Fully 57% of elderly Americans said they can get a same-day or next-day appointment to see a medical professional when they are ill. That is certainly more than those who can claim such timely access in Canada (45%), which is the oft-cited comparison made by critics of delays in government funded health care in the U.S. But older French (83%), Germans (81%) and British (65%) all say they have an easier time getting a needed doctor’s appointment than do Americans. It is true that people in the U.S. have more timely access to specialists. Fully 86% of those who saw a specialist in the last two years said they had waited less than four weeks for the appointment. This compared favorably with just 46% of elderly Canadians who claimed timely care and 60% of the French and British. Moreover, Americans also were among the most likely to have discussed health-promoting behaviors with a clinician, to have a chronic care plan tailored to their daily life and to have engaged in end-of-life care planning. 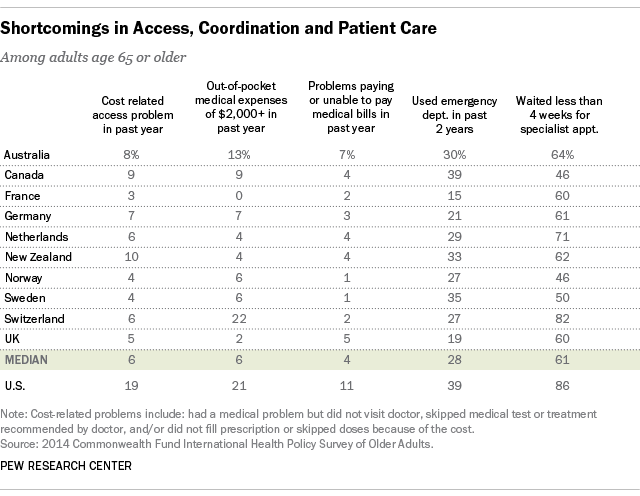 Nevertheless, Americans report more problems paying for health care and have less access to same- or next-day services than publics in the other advanced economies surveyed.